HELL YES! I always look forward to the anniversary episodes and I was almost certain you were going to do The Phantom, The Shadow or Sky Captain and the World of Tomorrow, but seeing it’s Raiders is even better! I love Raiders and I was lucky enough to see it on the big screen a few years ago when they had that brief theatrical re-release. Thank you SO much for putting up the transcript. As a writer I’m always interested to see the process of how things like this go from rough ideas to finished product. And those Jim Steranko concept prints, I freaking love those. I’ve seen Steranko at the NYCBM convention and last year he had some! But the line was long and I didn’t have much time there. If he’s at another convention and he has those prints I’d definitely buy them. I’d get the famous one of Indy standing but also the one of him punching the pilot. I’d love to get those signed to me and to put them up in my apartment. And it’s funny you guys mention George Lucas and the public’s perception of how he fits in with this. 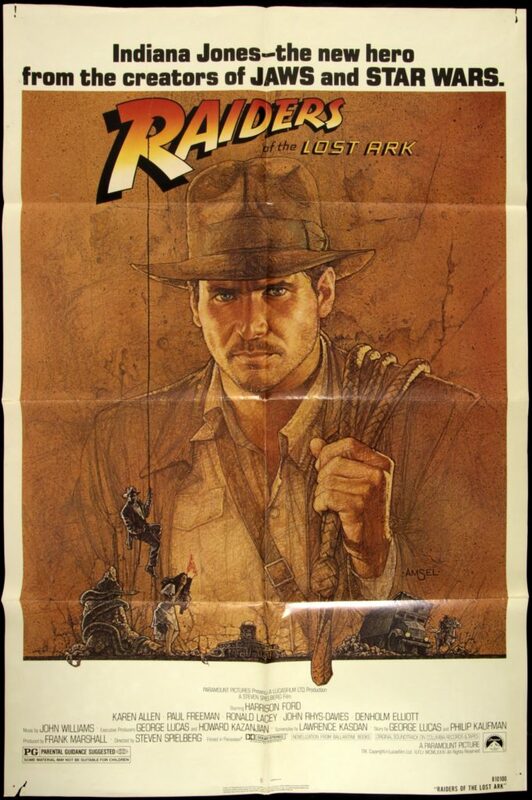 I know it’s his character but I so often associate Indiana Jones with Spielberg that I often forget Lucas was involved. I’m only halfway through the episode so please forgive me if I haven’t touched on anything else you guys brought up. Just wanted to give my initial thoughts and congratulate you on another amazing year. I love the podcast and appreciate all the hard work you guys do! Really love the podcast, keep up the great work guys! Also wanted to pass along The film that allegedly inspired Temple of Doom. It’s a classic Terence Fisher Hammer Film. Hey Tom! Thanks so much for listening, and taking the time to write us. We will definitely check out that 1959 film. We’re big fans of Hammer, so that’ll be a great treat for us. Thank you for the heads up!